If you need something to do in Calgary, you don’t have to look very far. There are many nationally, and internationally, acclaimed tourist attractions in Calgary suitable for the whole family. There’s something for everyone, from the art enthusiast to the animal lover. Currently located in the heart of downtown, this science centre is sure to entertain. It is considered one of the best in North America, attracting more than 300,000 visitors last year, including more than 50,000 school children. There are three main exhibit areas: The Amazement Park, Demo Theatre and the Discovery Dome. The centre is also committed to featuring at least three travelling exhibits and films per year. The Amazement Park is designed for children above the age of four and serves as a fun, educational and interactive activity centre. Children can learn important scientific facts while they learn how things work. The Demo Theatre covers a variety of science topics through interactive demonstrations and short movies. The Discovery Dome, consisting of a huge dome screen and wraparound digital sound system, can take your party from the backyard to outer space. Stunning images and clear, realistic sounds come alive to educate and entertain. More exciting exhibits and activities are set to come in 2010 when the centre moves to a new facility, adjacent to the Calgary Zoo. Have you ever wished you could go back in time? With one visit to Heritage Park, you’ll be able to do just that. The large, 127-acre “village” is set in the 1930’s and 40’s and is designed to educate visitors on Alberta’s rich history. Topics covered include the history of beer-making in Alberta at the Big Rock Interpretive Brewery and an introduction of the automobile and how it impacted development at the Gasoline Alley Museum. If you need a break from learning, several shops, including an antique portrait studio, await your visit. One of the great things about Heritage Park is its interactive nature. You will have the chance to actually “meet” fur traders, railway workers and prairie town folk. Take a ride on an authentic steam train, Calgary’s only paddlewheer, or simply enjoy the antique midway. Cameras are definitely recommended. The Calgary Tower has been a fixture in the city skyline since 1968. It is one of the first of its kind and without a doubt, provides the best view in Calgary. One of the unique features about the tower is its association with the 1988 Winter Olympic Games, where a flame was kept lit atop the tour for their duration. 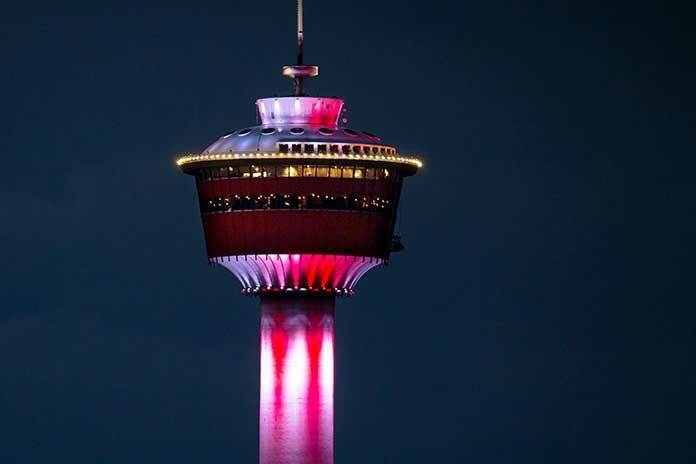 It is also lit for special occasions, like Canada Day and in support of the local NHL team, the Calgary Flames, should they be in the playoffs for the Stanley Cup. The Calgary Zoo was one of the first zoos in Canada and is still one of the largest. It houses more than 1,000 animals and 290 different species. The zoo itself is split into areas reflected by animal types and their associated biospheres. These include: Australia, Botanical Gardens, Canadian Wilds, Destination Africa, Eurasia, Prehistoric Park and South America. The zoo offers activities for the whole family all year. In fact, the only day you’ll find its doors closed is Christmas day. During the summer months, you can take a leisurely stroll through the animal exhibits. In the winter season, the much-anticipated “Zoolights” festival is held. This display, made up of three million lights and based on the animals in the zoo, is one of the most cherished events in the city. Despite its name, the Glenbow is more than simply one of the largest museums in Canada. It is, in fact, a museum, art gallery and library all in one. Offering programs for families, adults and schools, it’s a popular destination all around for those wishing to fully experience cultural and western heritage while at the same time learning about the world. Inside, you’ll find more than a million artifacts and 28,000 works of art. Many of these are part of the permanent gallery, but the Glenbow also provides visitors with the chance to see external and travelling exhibitions from all around the world. If you’re more adventurous, you may consider driving 10km outside the city to enjoy a day of rides and attractions at Calaway Park. As the largest of its kind in Canada, you’ll be treated to 33 rides and countless shows, games and activities. Why not make a night of it? Included in the cost of your admission is access to the park’s RV and camping site, which offers full services and power. If you’re looking for an in-depth, interactive experience, the Military Museums in Calgary are the destination for you. Among many other activities and learning opportunities, you will experience actually walking through a WWI trench and learn about the Canadian tank unit. Currently, the museums are made up of four regiments, in addition to the Army Museum of Alberta and the Naval Museum of Alberta. The museum is continually expanding and will soon be the largest tri-service military museum in Western Canada. Aside from the year-round destinations, Calgary is home to many world-renowned events that reflect the diversity and heritage of the city; these tourist attractions in Calgary are unique and entertaining. And as one of the largest cities in Canada, you’ll find countless concerts and events to meet any budget and mood.